genius! Clothes go inside, kids ride on top and only $50. Available here. I've been thinking of getting these -anyone have one and what do you think? I've seen this before and am planning on getting one when my boy is a little older, that is if we ever go on a trip. I think my toddler would get sick of pulling this along, hence end up leaving me with more baggage. 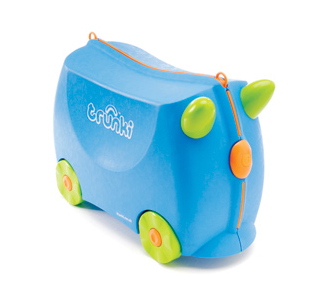 We love the trunki, and can highly recommend it!